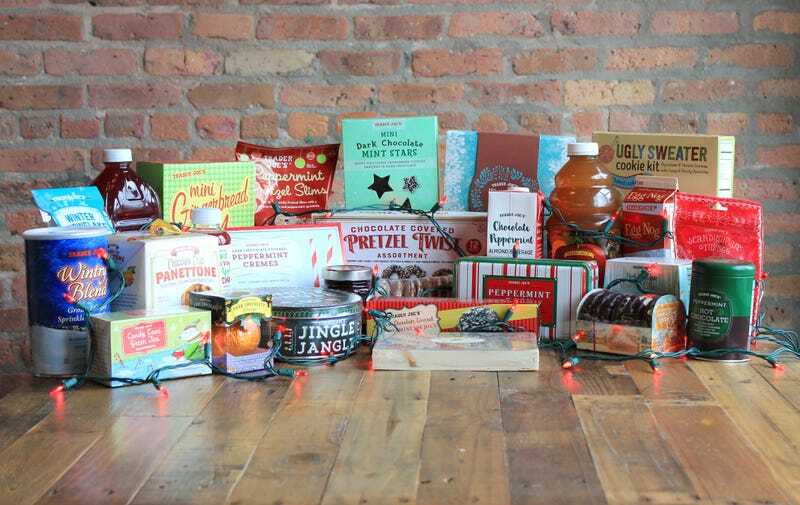 We taste-tested every one of these Trader Joe’s holiday-themed food and drinks in one sitting, God help us. Apricot, fig, and cherry paste rolled in sesame seed or coconut. This is something grandma used to save her nickels to buy, before candies and flavor existed. Alluring premise, disappointing execution. Overwhelming menthol flavor, like someone had squirted Colgate into hot cocoa. A York Peppermint Pattie, but somehow chewier, plus it gets stuck in your molars. Like the peppermint cremes, these marshmallows suffer from the same toothsome, artificial-tasting fate. Comes with eight cookies, packaged icing, and sprinkles. Fun if you enjoy exerting much artistic effort only to destroy it in seconds. Classic, velvety, a note of spice—now let’s rum this joint. Surprisingly creamy, not a desiccated loaf like many panettone. Thought this tasted boozy, but it was the tang of the sourdough. Oh Lordy would this be great as French toast. Cider vinegary with a light effervescence. You could barely discern the cranberry or apple over the fermented black tea, though. The most divisive of chocolate-covered fruits! Pro: Smashing one open! Con: That 1970s-reminiscent artificial orange perfume. Potpourri flavors of apple and blackcurrant juice, orange peel—like mulled wine without the booze. In other words: add booze. Delightfully crunchy, not too sweet, just enough spice. For a gummy candy, this has a soft and luxurious texture. A decaf mint tea with orange peel spice and a subtle, rounded flavor of vanilla. Sometimes cider can be cloying with spice, but not here. The allspice, cinnamon, cloves, and citrus peel flavors are more a gentle reminder than overbearing presence. Like a cherry butter minus the tart zing, with a subtle and soothing citrus peel undertow. A medium-dark roast with clove, cinnamon and peppercorn flavors. Trade your pumpkin spice for this festive-tasting brew. It’s winter, all the pumpkins are dead now anyway. Comes in three varieties, including peppermint dark chocolate, almond dark chocolate, and milk chocolate with rainbow sprinkles. Hefty pretzels, thick chocolate coating—feels substantial and indulgent. Cute, tiny, proper cookies for dipping. The gingerbread offers a light spicing and a meltingly smooth icing. The hot cocoa variety tastes like Swiss Miss in cookie form, down to the marshmallow icing! An addictive chip-like crunch, and the saltiness offers an appealing counterpoint to the peppermint exterior. A Trader Joe’s classic, featuring an assorted tray of chocolate-covered popcorn, pretzels, and joe joe’s, with mini peanut butter cups and milk chocolate candy. A constellation of crunch and chocolate with every bite. A thick, rich hunk of peppermint dark chocolate, layered with white truffle fudge, then embedded with bits of crunchy candy cane pieces. This feels like a millionaire’s version of Frango mints. Ladies and gentlemen, we have captured Christmas in handheld form. A mathematically perfect proportion of dark chocolate coating to interior cookie crunch with candy cane sprinkles. Leave this out for Santa instead.